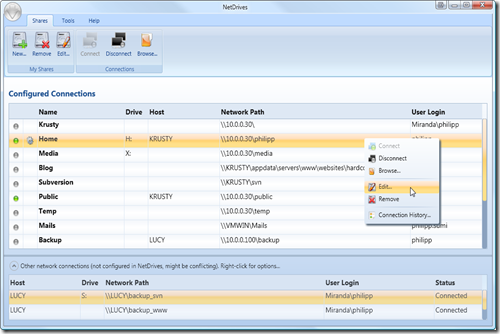 NetDrives is a Windows utility that helps you manage your network shares and mapped network drives. Simple configuration of network shares and user logins. Supports both UNC connections and mapped network drives. Quick access and monitoring of shares through system tray (optional). Optionally reconnects to selected shares on startup. Optionally starts with Windows and runs in background (system tray). Secure password storage (based on Windows Data Protection API). Open source (C#, WPF). Download source code here. access to all configured shares. to use tools allows you to create, manage, and diagnose your network shares. when it comes to drive mapping, automatic connections and login modes. Philipp, thank you for this much needed utility. Do you know why Netdrives would not list the Z drive letter on a particular machine? is it possible to add the shares somewhere in the registry or the config file? I want to use this with the guest user. I configure the shares in NetDrives but when i log off as expected with Guest user all the settings are deleted. Is it possible to save the settings so for the guest account? Hey guys, sorted it out. Just in case anyone else wants to do it. Now when you start Netdrive the configured Network share list is shown. Thanks for taking the time to create these tools and making such detailed tutorials, really appreciate your work. Just a request: it’s possible organize share by groups? I move from company to others and for each one i have to connect to 2 or 3 share. If connecting to “Company A” automatically connect to share “Company A-1” and “Company A-2” should be very appreciated.